After my dad died four years ago, while catching up with family, my cousin, Eddie Hass, shared a long-buried family secret: we were Métis. Rebecca Hass, after the ceremony with her cousin Eddie, on the French River. My dad died four years ago. Dad grew up in an isolated community in the north of Ontario. He was estranged from many in his family, but when he died my mom wanted to have some of his ashes spread where he grew up, the French River. She reached out to her nephew, my cousin, Eddie Hass. As they were catching up, Eddie shared a long-buried family secret. Eddie had discovered it when he was working on our family history about ten years ago. Dad certainly never knew, if he had, I know he would have been so proud. 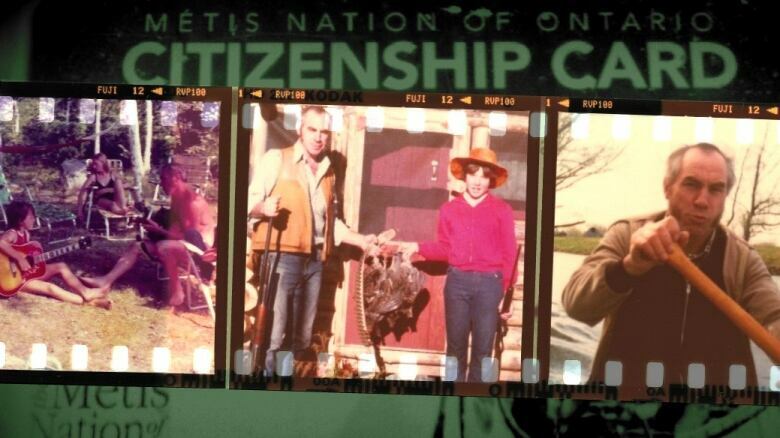 I could think of no better way to celebrate the way he raised me, hunting and fishing and working for conservation, then to get my Métis citizenship card. Several of my cousins have their cards in Ontario and they provided me with the documents I needed. But applying four years ago I still don't have my card. The B.C. Métis Nation asked whether my family historically identified as Métis and could I prove that? This question sparked an anger and hurt in me, that was surprising. As time dragged on, and my appeals by phone and email went unanswered, I wondered, why does this matter so much to me? I didn't want to be some kind of cultural pretender. I wondered how could I be Métis without this card? My cousin Eddie, who had served as a Senator with the Grand River Métis Council encouraged me to self identify, but I had no idea what that even meant. I just knew I felt like a fake every time I said "I am Métis". So I flew to Ontario, met and ended up becoming friends with a cousin I never knew. 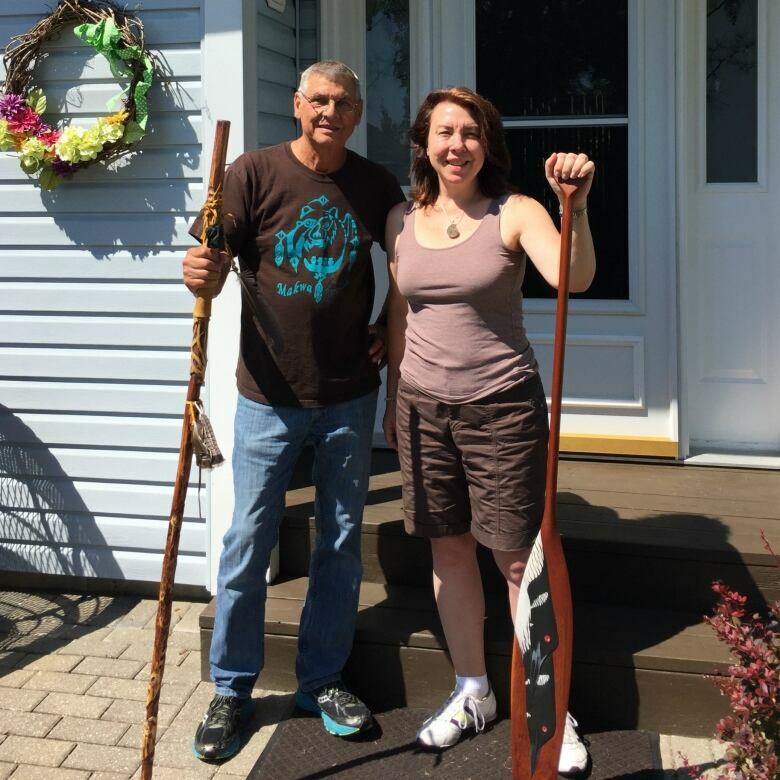 The documentary follows Eddie, acting as my guide, on my quest to discover my Métis identity. Rebecca with cousin Ed Hass in front of his home in Bellwood. This was the first time in a doc I was asked to turn off the recorder. My cousin, Eddie, had planned a ceremony for the two of us, a welcome and an introduction to the first nations part of my culture as a Métis. We travelled by boat to where he had spread my Dad's ashes four years ago on the French River. We were on a bald rock surrounded by trees, with a view of a bay. The crickets were singing in the marsh, and Eddie built a small fire for us. The river was so quiet. I had been recording our conversations all day, but when the moment for this ceremony came, he asked me to stop. He had words to say and rituals to share that were 'sacred'. I respected his request and didn't tape it. I think sometimes the act of recording can cause people to feel like they are on display, and they can't really experience a moment. Sacred means to me that you need to show up with your heart, and the tape recorder at times can feel like an obstacle to that. But that doesn't mean that moment isn't in the story. It's an important one. But I had to get creative. And you should too if you confront something similar. To cover this, I recorded an audio journal that same night. I used those fresh reflections in later writing the narration part of the script. 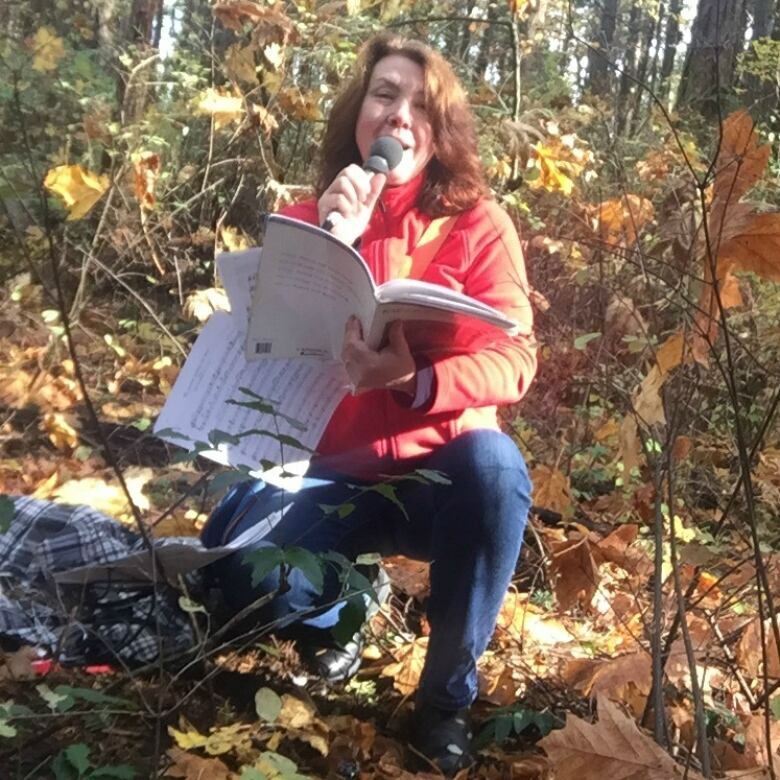 Rebecca recording aria in the woods. The other significant moment that was not recorded was my choice. After taping a Métis elder and myself in the woods making a canoe rib, I decided on the spur of the moment that I wanted to give him a gift. As I am a professional singer, I decided I would give those present a private performance of an aria. At the time it felt like it had nothing to do with my documentary. There I was, standing in the woods, on a bed of cedar shavings singing away. When I think now of recording it, I know the other issue for me was that it would have made it feel like it was 'for the radio'. A showpiece. Not a gift from the heart. I will never forget how it felt to open up my voice in that unguarded moment to the trees and sky. And of course, what did my editor want when she heard my story that day? Tape of me singing in the woods. That was a breakthrough moment in the documentary in hindsight, and I needed that tape. My producer suggested that I recreate the moment in another forest. It could stand in for the actual moment. And so, there I was, two months later standing in a grove of cedar trees in Mount Park in Victoria getting ready to sing. I imagined that scene from August in my mind's eye and recorded that aria. It was really strange to do, and I kept hoping a dog wouldn't start howling in sympathy from a nearby trail. Singing it the first time for the Métis Elder was memorable, but there is no doubt, I'll never forget my surreptitious recreation in a public park! 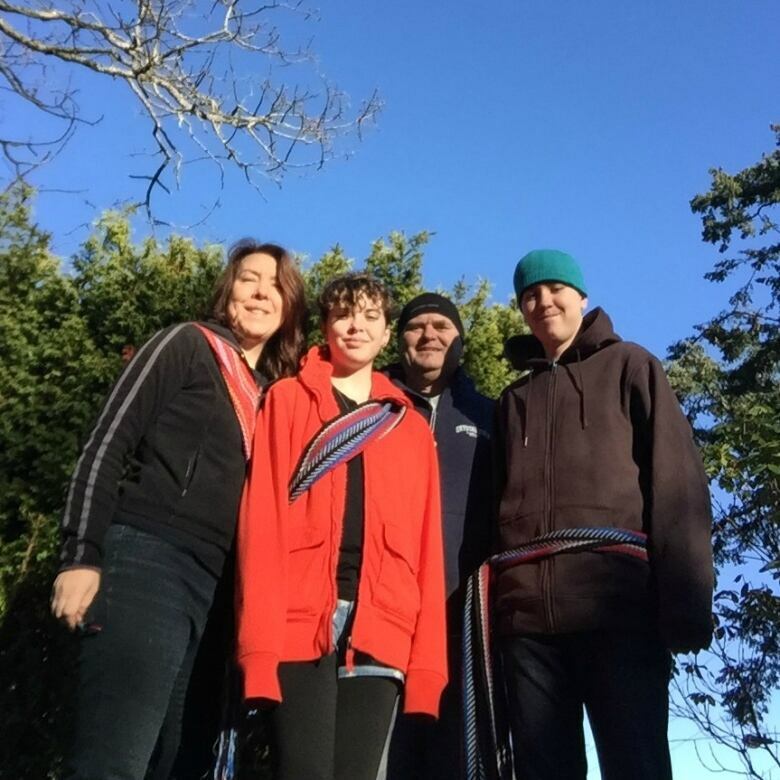 Rebecca with daughter Clara, husband Mike, and son Fletcher. Recording such a personal story about my identity was challenging in surprising ways. I discovered that to experience something deeply and report on it is a balancing act. I was continually trying to keep a foot in both camps of story subject and the objective observer. I also felt awkward in some of my questions I wanted to record. Almost everyone I spoke to had only discovered their Métis roots in the last 5 to 10 years. It had been buried by the generation before due to fears of racism and for some, fears of becoming part of the residential schools. 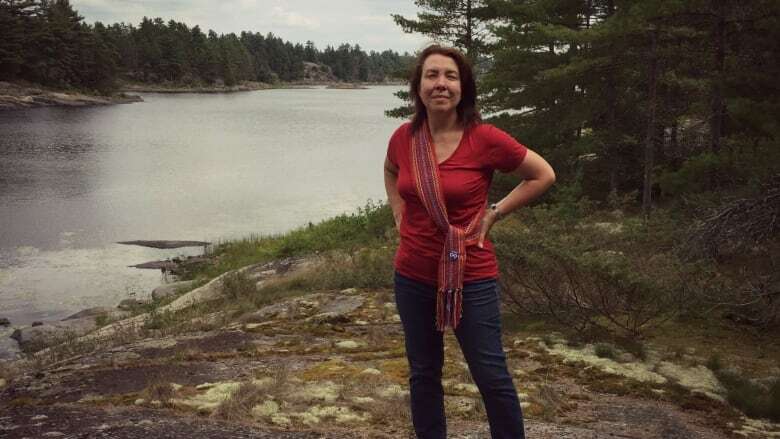 While I was coming to them as if they were the experts who could tell me how to be Métis, over and over again, they seemed to be struggling to feel it themselves. Being Métis turned out be a political quagmire of historical documents, secrets, current Supreme Court decisions and Métis politics. Telling this story has been very empowering. I posted photos on facebook of my personal quest while it was happening in August. The outpouring of support and interest it created genuinely surprised me. What was once a dirty secret in my family is now a true source of pride. I also discovered that more people are searching for their ancestry then I knew. Publicly sharing my journey drew out this need in others to know where they came from and what that means to them today. And like me, the importance of connecting to a community to claim that identity.